The archetypal African dictator, Mobutu Sese Seko, a military officer, rose to power in the Congo by displacing the populist left-leaning leader Patrice Lumumba. Burnishing his nationalist chops, he renamed the resource-rich, strategic former Belgian colony Zaïre, a pronunciation of a local Kikongo word for "the river that swallows all rivers." 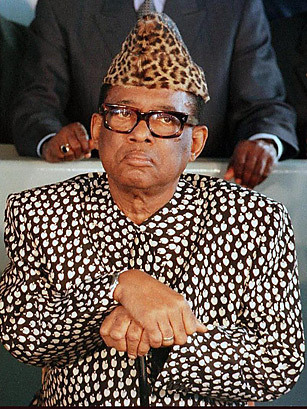 Mobutu swallowed all his country's politics, building a highly centralized state in which power radiated from his presidential palace and tales of his nepotism and corruption  including Concorde-flown shopping trips to Paris  were legion. Propped up with aid from the West  for years, Zaïre was one of the biggest African recipients of U.S. funds  Mobutu presided over the country for some four decades, despite myriad reports of abuses and human-rights violations. The end of the Cold War prompted him to embark upon hesitant political reform, but it took civil strife and the victory of armies loyal to Laurent Kabila to unseat Mobutu in 1997. He died of prostate cancer shortly thereafter in exile in Morocco. See "Zaïre: Waiting for Kabila."